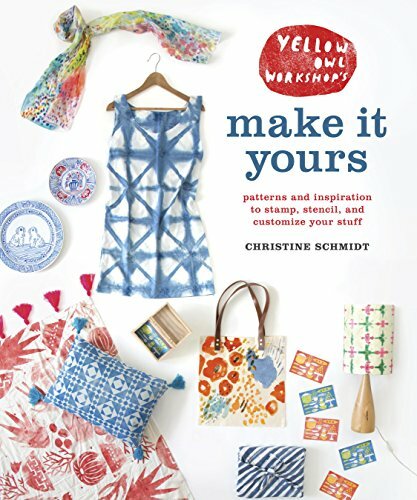 Yellow Owl Workshop’s Make It Yours: Patterns and Inspiration to Stamp, Stencil, and Customize Your Stuff. In Yellow Owl’s Make It Yours, you’ll learn techniques for bringing personal touches to objects all around your home. Upgrade your plain scarf with a colorful abstract design. Turn a dresser into an eye-catching art deco showpiece. Whip up a desert-inspired quilt to enliven your living room. Expert printer and Yellow Owl Workshop founder, Christine Schmidt, shares her trade secrets for creating gorgeous projects using unexpected materials, from gold leaf to cake fondant.